Petunias doesn’t stop at Icky Bags, though. 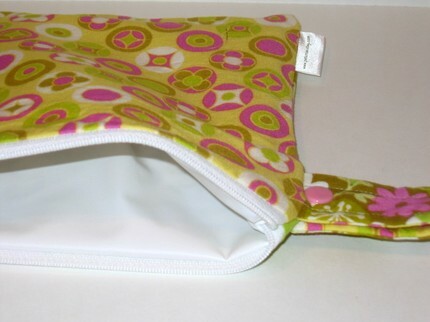 They also offer 5×5″ reusable snack bags, bibs, zipper pouches, organizers, and pocketbooks! Who would have thought that so many things could be made with fabric, waterproof material, snaps, and zippers? All of her fabrics are posted online at http://petuniasfabrics.blogspot.com/. I’m not sure where she’s found all of this beautiful material, but looking at them alone just inspires creativity! When looking through Petunia’s other blog at http://petuniasbykelly.blogspot.com/, I found out that some of the proceeds from each purchase are donated to World Vision or CRWRC. This definitely warms my heart as I also support each of these organizations. If you don’t already know about them, definitely Google them–they help provide sustainable living physically and spiritually to children and families around the globe. My favorite thing that I’ve seen on her sites is actually not an ICKY Bag, though. 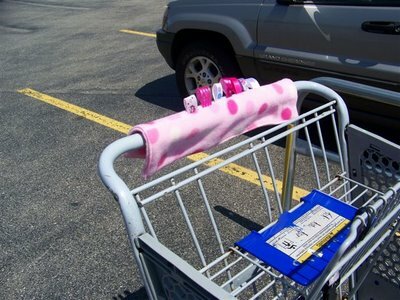 It is a shopping cart handle cover. It’s a brilliant idea! Less cumbersome than an entire shopping cart seat cover, and more interactive for your child, too. Buy it now! Through August 15, 2009, Petunias will be giving you 10% off of your order (shipping not included) if you use the code LMSBLOG10.